EDIT: Giveaway is officially over. Congratulations to Loraine Ellis for submitting the randomly-chosen 371st entry. Daniela will email you soon with details on how to claim your free prize. Maybe it's much too early in the game, but I thought I'd ask you just the same ... what are you winning on New Year's Eve? A turquoise bracelet from Daniela of Rica Jewels could hold your wrist good and ... well, not too tight! She's gifting a beautiful bracelet in the design above to one of my lucky blog readers this holiday season. The Tibetan cuff bracelet is made of silver white metal and genuine turquoise. Daniela's unique turquoise jewelry is popular year-round, but especially as a December birthstone gift idea. All USA orders in her Etsy shop are currently being shipped Priority Mail 2-3 day, with the option to upgrade to Express Mail for next day delivery at check out if you're in desperate need of a pretty present fast. Here comes the jackpot question in advance ... what will you choose? Use the Rafflecopter below to enter to win worldwide giveaway before 11:59pm EST on December 30, 2015. Be sure to leave the mandatory comment on the blog post with the same name you use to fill out the Rafflecopter - all entries by winner must be easily verified or a new winner will be chosen. I love the silver cuff! The Derne ring, I love them all!!! is very gorgeios. That ring appeals to me. I love the Meris earrings! I love the Ayala Necklace!!! They have so many gorgeous items...one of my faves is the Batya Necklace. Stunning. I love the Alisa Ring. I really love the Bela Champagne Necklace. I like the blue Agate earrings! I also like the mantra mix metal bracelet. i like the Lina Reversible Ring. IMPOSSIBLE to choose just one! I really love the Avital Meditation Ring, the Meris Earrings in blue, as well as the lovely Melis ring! Can I have them all!? The Infinity Necklace is stunning! A lot of their products are beautiful! I'd lovin the Batya necklace. I'm in love with the Bela Gemstone Necklace. It's gorgeous! The Bela Gemstone Necklace is my favorite. The Bela Earrings are amazing. It is difficult to choose one. I like the meditation rings but I hardly ever wear rings. The Tribe necklace is stunning, unique and my first choice. I love the Ayala Necklace, absolutely gorgeous. The color is mesmerizing. oh no, I prefer Bela Earing for my GF, thanks. The Riea Necklace is gorgeous! I love the meditation rings ! All the jewelry is gorgeous but the meris earrings really caught my attention. One of my favorites is the Riea Necklace. I have several turquoise pieces and this caught my eye! Infinity Lariat Necklace, Gold Vermeil necklace, Labradorite necklace, gemstone necklace, birthstone necklace RINECK081 is my favorite Esty item! I really love the Tarie Necklace!!!! I love the Ada Meditation Ring! I really like the Meris Earrings. I love the Serinity Earrings.They caught my eye right away. Batya Necklace is my absolute favorite from the shop. The lola earings are cute! Love the Blue Agate earrings! 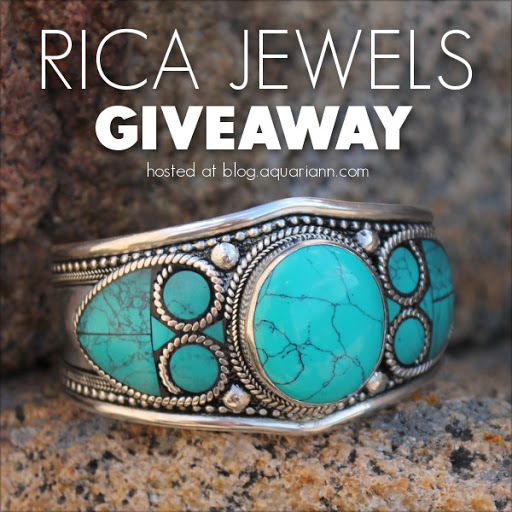 #free, prize, contest, sweepstakes, giveaway, etsy, turquoise, silver, newyearseve, bracelet, cuff. I like the wave bracelet. I love the whimsical nature of the jewellery, but some of my favourites is the Batya Necklace and then off course the Dasi Meditation Ring. It has my favourite colours in it, and is just gorgeous! My favorite is the Dora necklace. I love the Boho Ring. I love the Avital Meditation Ring. The Dasi Meditation ring is what I like. Well it was a hard choice to pick one. However, the Riea Necklace is so beautiful. Turquoise is my favorite! My favorite is the Chanti Pendant. I love the Bela Gemstone Necklace. It's beautiful! Cihay Earrings, my wife has very good taste. The Meris Earrings look great. The Dasi Meditation Ring would make a unique give for a unique person! The Ela ring is my favorite. The Bishnu Bracelet is perfect!!! I love it!!! The Dasi Meditation Ring is my favorite piece. I've always wanted spinning rings because I am a fidgeter especially when nervous. I really like the Bishnu Bracelet! I also absolutelY love the Bela Gemstone Necklace.